The southern San Andreas fault (SSAF) is a plate boundary strike-slip fault, where the Pacific plate moves northward relative to the North America plate. There have been large earthquakes on this fault in historic time, including the 1857 Forth Tejon earthquake. This 1857 earthquake is estimated to have been a magnitude 7.9 earthquake (larger than the recent earthquake in Sulawesi, Indonesia). There is also a record of prehistoric earthquakes on this fault, spanning the past 5000 years (Weldon et al., 2004; Sharer et al., 2007). These authors have determined that the average time between earthquakes on the SSAF is 105 years. However, the time between earthquakes ranges from 31 – 165 years. This large variation in inter-event time periods makes it more difficult to know when the next “Big One” will happen. 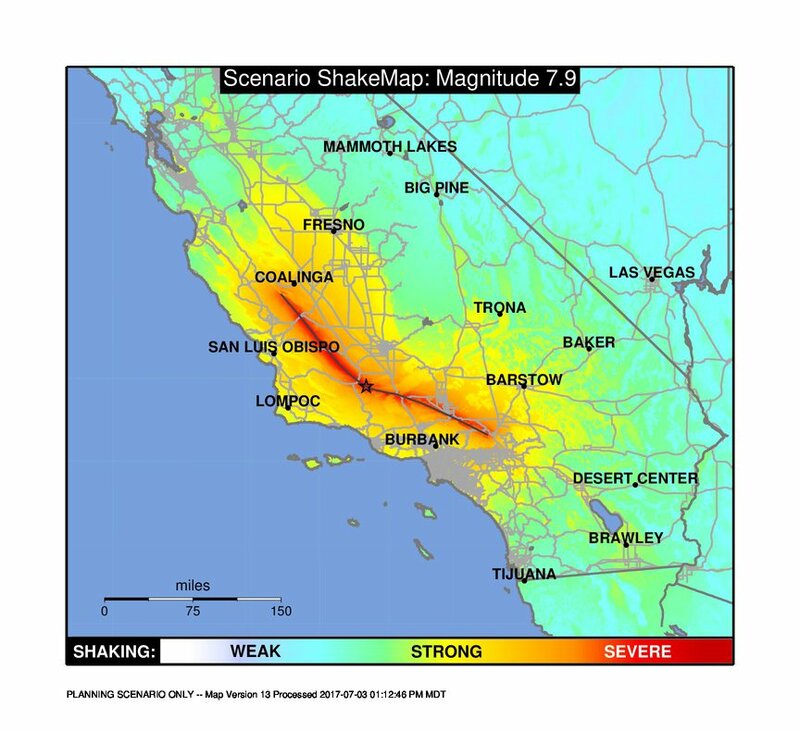 The USGS prepares earthquake scenarios based on our knowledge about past earthquakes and how future earthquakes may behave based on our empirical knowledge. Below is a USGS scenario map for the part of the SSAF that ruptured in the 1857 Fort Tejon earthquake. The color scale represent relative earthquake shaking intensity based on the Modified Mercalli Intensity scale. Warmer colors represent areas of stronger ground shaking. While the map below is based on a computer model, this is a good estimate of how strongly the ground shook in 1957. Note how the strongest ground shaking is adjacent to the fault. USGS Shakemap scenario map for the southern San Andreas fault, showing an estimate of shaking intensity from an earthquake similar in length and magnitude to the 1857 Fort Tejon earthquake. The part of the fault that slips in this scenario earthquake is shown as a black line, very similar to the known extent of the 1857 earthquake. Below is a map prepared using the temblor.net app. Seismicity from the past month, week, and day are shown as colored circles. The temblor app suggests that this region of San Bernardino, CA has an earthquake score of 93. To find out what your earthquake score is, enter your address in the app at temblor.net. Earthquake Risk map for southern California, centered on the inland empire. Active faults are shown as red lines. Earthquakes from the past month are shown as circles. Earthquakes can cause damage to buildings and other infrastructure due to the shaking intensity. The closer to the earthquake, the higher the intensity. Buildings are located on different types of bedrock and this can amplify the shaking intensity in places. How do we know this? We have made direct observations of the damage from earthquakes. There is ample evidence of what happens during earthquakes like what will occur on the SSAF someday. The same fault system, further north, has also ruptured in historic time. In 1868, the Hayward fault (a sister fault of the San Andreas) had an earthquake that caused extensive damage in the San Francisco Bay area. The USGS and the California Geological Survey are using the 150 year anniversary of this earthquake as a tool to educate the public about earthquake hazards along these active faults in northern California. Here is a short video about the HayWired Scenario. More can be learned about how to outsmart disaster at the “HayWired” website here. Below is a photo from the aftermath of the 1868 Hayward fault earthquake. 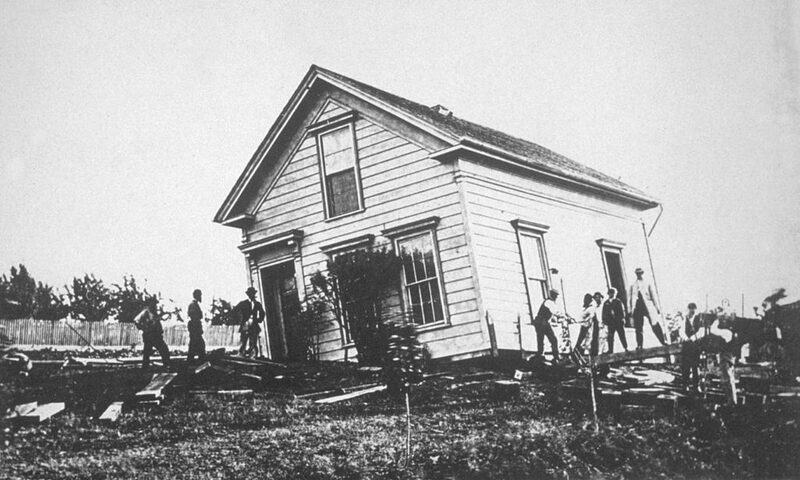 This photo shows damage to “Pierce’s House,” a building damaged by the 1868 Hayward fault earthquake. Image source: Wikimedia Commons, public domain. Another historic earthquake that caused extensive damage in California is the 1906 Great San Francisco earthquake, another San Andreas fault earthquake. The damage from this earthquake included building damage and fire. Fire is one of the most common damaging effects of an earthquake like what will happen someday on the SSAF. Below is a photo showing damage to houses that were built on material that did not perform well during an earthquake. 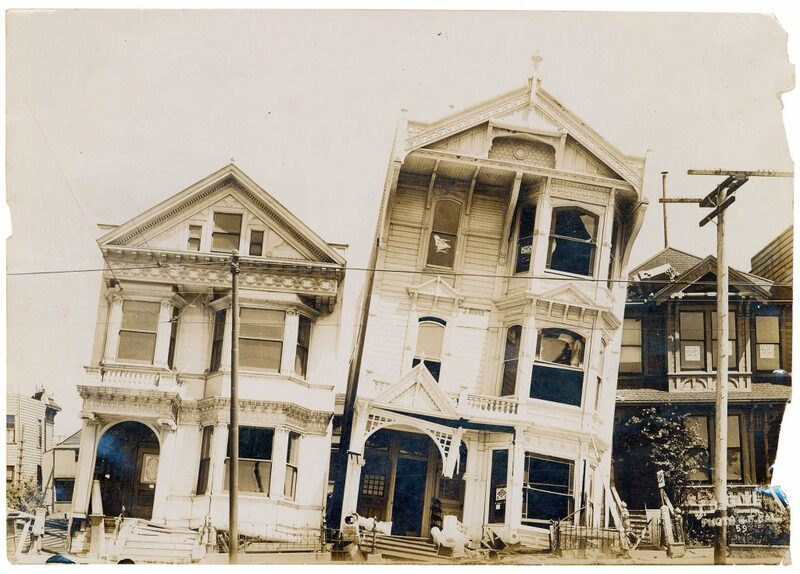 Photo of houses following the 1906 San Francisco earthquake. Photo from National Archives Record Group 46, public domain. The combination of hazard and exposure (people) is what we call risk. When people are exposed to earthquake hazards, they are at risk from damage due to those earthquakes. If there is an earthquake and nobody is there to experience the earthquake, there is no risk. One major difference between 1868, 1906, and today is that there are more people that live close to these earthquake faults. While the average number of earthquakes stays relatively constant through time, as the population grows in earthquake country, the risk also grows. Do you live along the San Andreas or some other plate boundary fault? What about another kind of fault? To learn more about your exposure to these hazards, visit temblor.net. When is the next Big One? We don’t know when the next southern San Andreas fault big earthquake will happen. Currently there are no scientifically demonstrated ways to predict earthquakes. We can use the frequency of past earthquakes and patterns of earthquake occurrence (current seismicity) to estimate the chance that an earthquake will occur over a period of time. These estimates of future earthquake occurrence are called forecasts. Most people are familiar with weather forecasts, but we know much less about earthquakes than we do about weather. Because of this, earthquake forecasts may not have the same amount of accuracy that weather forecasts do. However, these forecasts are based on the latest cutting edge science about earthquakes and are monumentally better than simply tossing a coin. The cool thing about these forecasts is that the science behind them improves over time as we learn more about how earthquakes happen. This is another improvement over coin tosses, which flip pretty much the same as they did since coins were invented. The Whistle is an upcoming series of broadcasts produced by the Empire Network, a collaboration between KVCR, PBS, and National Public Radio. This four-part documentary series that dives into earthquake science, history, local and international earthquakes and tsunamis, California preparedness and immediate response, prevention, mitigation, retrofits, resilience, sustainability, conservation, incentives, challenges, new technologies… and solutions. Are we ready for the Big One? Earthquakes and the San Andreas fault. The Ring of Fire. What do we know about earthquakes today? What causes them, how often, why we know the Big One is due. Evolution of seismology and our understanding of earthquakes and plate tectonics. How did the First Nations and early European settlers deal with Earthquakes before modern technology? How dangerous is the threat and how much of an impact can a big earthquake cause? What will happen when the next big one hits? Episode 2 covers how our immediate response might unfold during and following the Big One. 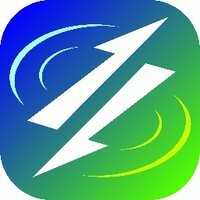 Episode 3 reviews our knowledge of the current state of infrastructures (buildings, roads) and how an earthquake might impact these investments in society. Finally, the 4th episode presents an evaluation of how we have improved our ability to be resilient in the face of disasters from the Big One following decades of applying the scientific method to our observations of earthquakes. 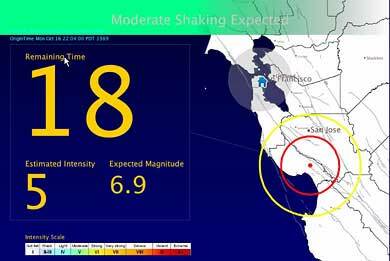 How will Earthquake Early Warning work and how will we benefit from this? Learn more by watching The Whistle. 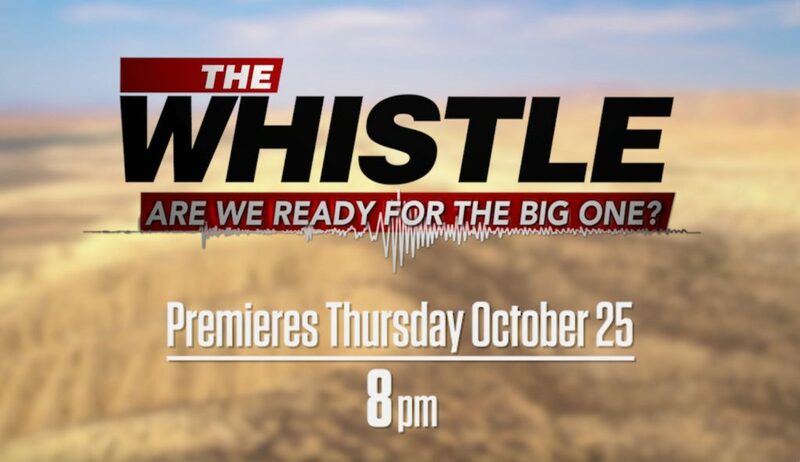 The premiere for “The Whistle, Are We Ready for the Big One?” premieres on Thursday Oct. 25. Watch the first episode on television, or head to this website where the video will be available to stream online.